Let the new trainer games begin! Oh…crap…wait, they already began – earlier this summer with new CycleOps trainer, Elite trainers, and even Tacx trainer updates. But, with a brief summer intermission completed, we’re back into the swing of new trainer announcements. 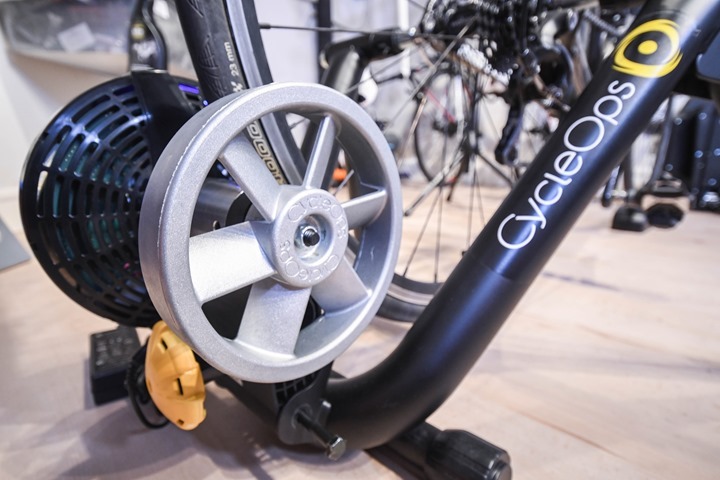 And oddly enough, it’s once again CycleOps kicking off this round of new trainers – just like it was back in May with their new Hammer direct drive trainer. This time around they’re focused on a trainer half the price ($599) that appeals to the $600 crowd of other trainers in the same price range. 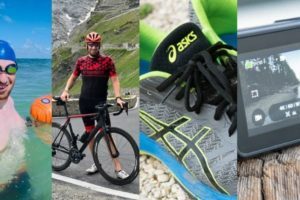 This electronic trainer is fully controllable from apps the likes of Zwift, TrainerRoad, Kinomap and more. Plus, it transmits all your powers on ANT+ & Bluetooth Smart. I’ve had one since early July* and have been using it throughout the summer. While it is a pre-production unit, I’ve got a pretty good gist on things. As such, since it’s a pre-prod unit, this isn’t a full in-depth review. Think of it as more of a preview. Once the final unit comes out this fall, I’ll look to squeeze in a full in-depth review then. *Funny tidbit, I had to cut short my meeting with them that day, as The Girl went into labor just prior to the meeting starting. Well then. That settles it. Alternatively, you could just go with the more academically Latin meaning, which is simply ‘Great’. Hmm…, Urban Dictionary seems more 2016 to me. In any event, the trainer is essentially competing with the Wahoo KICKR SNAP, Elite Rampa, and the Tacx Vortex. That means it has the full electronic control of a resistance controllable trainer, but doesn’t have the direct-drive (wheel-off) design of something like the KICKR, NEO, or Hammer. Still, it can deliver the power just fine – coming in at a peak resistance of 1,500w. The above line-up roughly matches what other companies have in the market. The only difference is that Tacx and others will also transmit your speed, and cadence too on Tacx trainers (albeit estimated, but usually pretty good). But otherwise, the above specs make them equal to others from a core power/trainer tech transmission standpoint. It’s these transmission specs that matter though – because if you want to be able to use any of the dozens of trainer apps out there, you definitely want to be on these standards. This allows this trainer to easily integrate with Zwift, TrainerRoad, Kinomap, and numerous others. It also allows you to control it via your bike computer – such as the Garmin Edge series, and soon the Wahoo ELEMNT. The unit is capable of receiving firmware updates for itself, which will be done via Bluetooth Smart wirelessly. That’s also in-line with all other competitors. Officially the trainer is listed at 69 decibels at 20MPH, and my testing seems to put it in the same rough region. Sound testing is full of variables, the most notable being speed (not power level), but also the exact tire used. Some tires are louder than other tires (oddly, I find trainer tires are among the loudest). To demonstrate the sound levels, I cover it within the video later on in this post. Plus, I get to pull out my newest and coolest decibel meter. Next we look at the compatibility matrix for bikes, which supports the following types on its 2” roller width: 650b, 700c, 26″, 27″, and 29″ – up to a 2.0 tire. Note that it does not fit 650c wheels however, and not all 29er tires – so you’ll want to double-check your exact tire there if you’re looking to put either a circus bike or mountain bike on there. Meanwhile, the skewer holding system has three settings (I’ll talk about that more later on), which support the following skewer types: 120mm, 130mm and 135mm. Additionally, you can pickup an accessory thru-axle adapter for 142x12mm and 148x12mm. Finally, on the accuracy front – things are still a bit TBD in terms of the exact stated accuracy range they’ll be able to achieve. Right now it sounds like at least +/- 5% (same ballpark as others for this price range), but they’re hoping to get that down a bit lower by time they make a final accuracy claim. 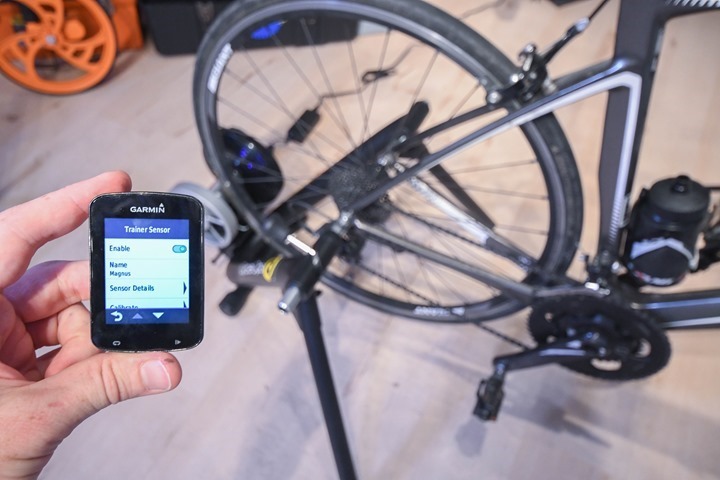 Note that it does support a roll-down calibration, and said calibration even works properly with the Garmin Edge units FE-C calibration menu (one of the few trainers I’ve found that does work properly there). For you non-video folks, we’ll continue on with the textual excitement. First up is that the trainer is actually pretty light. I weighed it at 20 pounds/9 kilograms, which is almost half the weight of the heavier KICKR SNAP. The most noticeable element of that being the frame itself is lighter. The flywheel itself is 2.6lbs/1.2kg. 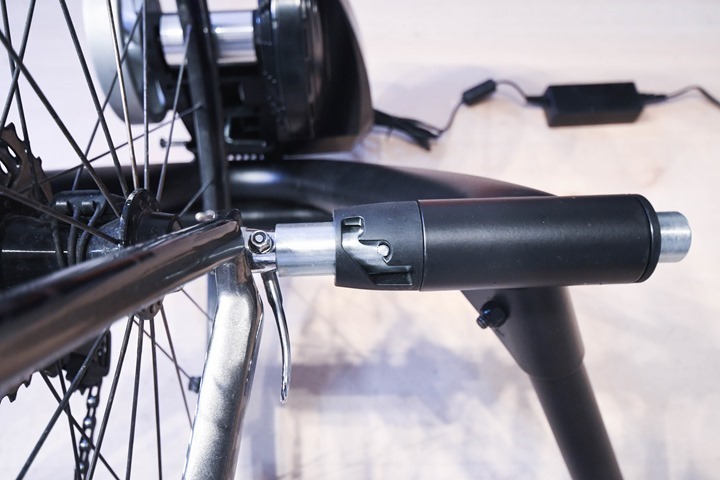 It’s the quick release system on the frame that’s different than other trainers in that it’s got three adjustability settings, which you can see below with those notches. This allows you to quickly lock it in place, even with dramatically different bikes. Once you’ve got the unit locked in, you’ll then use the clutch-knob style system that essentially works the same way as a gas cap on a car: Just keep turning until it clicks/pops. That’ll produce consistent power each time. This is easier/better than having to spin a knob a certain number of times and hope it’s right. As with any trainer that’s wheel-on, you’ll want to have consistent and good tire pressure (I usually just do 120psi, since that’s straight-forward enough). The resistance knob is that yellow handle. Now that everything is good to go, you’ll want to do a calibration/roll-down. In theory with both the locking system and the same tire pressure, you wouldn’t really need to do so each time. But in reality, I like to do one just before I start, and then about 10-15 minutes in after the tire has warmed up. The calibration process can be triggered from most apps, or devices – like the Edge series. With that – it’s just a case of riding like normal via the apps you prefer to use. In the case of CycleOps, they do have their own training suite, called Virtual Training, which is pretty extensive (actually, it’s the training suite with the most breadth out there). Of course, if you prefer Zwift or TrainerRoad, then those work too. In my testing, I found the power accuracy actually pretty solid for being a prototype. Especially an early prototype unit that they’ve told me the power isn’t perfect on; and that they’re working to get me an updated/final unit which improves the power accuracy. I’ll get some step data published shortly, but I found that as long as the resistance was strong and you did a roll-down, it was within 1-2% for me compared to both the PowerTap P1’s and a Quarq RIKEN. If however the wheel-on resistance wasn’t done correctly, then it was far more variable. But I’d like to see how the final units look before making any final conclusions there. As for road feel, the unit ‘feels’ like any other wheel-on trainer with a relatively small flywheel. It feels fine (like others in this price range), but isn’t particularly special in terms of feel. In many ways, until you get to much larger flywheel sizes, you won’t really get that inertia feeling, but those same resistance controlled trainers tend to cost a fair bit more (or, if at this price point then lack the resistance controlled elements). Said differently: I don’t tend to overthink road-feel. For me, a trainer is still a trainer, and still feels like a trainer – even the high-end ones. I’m still inside and I’m still staring at a wall. I can’t mentally undo that. Just to briefly compare to this to the Rampa, Vortex, and KICKR SNAP, I’ve added the Magnus into the product comparison database. This allows you to compare not only top-level specs, but also any trainer that I’ve reviewed or otherwise had hands-on time with. You can mix and match and make your own product comparison here. And again, don’t forget that you can mix and match and make your own product comparison here using the full product comparison database. This being the second trainer of the season for CycleOps, it helps to fill out a lower electronic resistance controlled trainer price point (they have a number of other non-electronic trainers that are far cheaper), while still giving folks the higher end option from them with the Hammer. Both units are slated for shipping this fall (thus a bit of a delay on the Hammer’s original August estimates). And it’s at that time that I’ll be able to make any final determinations for things like accuracy. However, at this point this looks like a very strong contender. As you can see, that $600 price point has numerous really solid options from a number of major players. So it’s in some cases going to be a matter of deciding which specific subset feature is the most important to you (i.e. accuracy vs max incline vs max wattage). Or perhaps it’ll just be styling. I do think that simple product availability may end up being a huge driver for trainer purchasing decisions this year. In any case – stay tuned for more on this trainer and many others as we move into the northern hemisphere training season. Thanks for reading! Preemptive footnote: I’ll have my annual trainer recommendations guide out in September, based on units that I have in my hands at that time. Rather than waiting forever and ever for last minute trainers into October and even November to release the annual trainer guide (like years past), I’ll be drawing a bit of a line in the sand earlier this year. Thankfully, most trainers being announced I’ve had some amount of hands-on time with already. Also note, yes, there are more trainers to be announced, but you won’t see my posts/comments on them here until they are officially announced. Mmmkay? Heads up: You can now pre-order the CycleOps Magnus from Clever Training using this link. As usual, by using the DCR Reader coupon code of DCR10BTF you’ll save 10% and also get free shipping. That helps support the site here, plus of course gets you a great deal. Oops, fixed that, not sure how ‘No’ got in there. Anyway, all good, thanks! As for street prices in Europe on trainers…well…it’s a mess. Basically US has MAP (minimum advertised price), which makes it relatively straight-forward for figuring out prices since companies can’t sell below a listed price. In Europe though, it’s all over the map because MAP is illegal. So there’s then list pricing, which is the closest thing to compare to. After that, it just depends on how much the retailer wants to take a loss on one item to get you hooked into their system for something else down the road. I think the list price is only the manufacturers suggestion…. Shops get the items for about 40% less. (They have to live from the difference). Large orders from a shop can get more discount, especially when the manufacturer is overstocked or a model is going out of production. This worked well before the internet and the megastores. Now the customer just browses till he finds the cheapest option – and shops take a 20% (or less) margin in order to move the items in bulk. As a result nobody pays list price – it is a starting pont from where you search for cheaper options. (The Tacx Vortex Smart goes for between € 389,- to € 449,- in the Netherlands at the moment, according to a quick google.. That is including VAT and shipping). In the US, list price is actually a requirement (yes, it’s silly). Violating MAP (minimum advertised price) will typically get a retailer banned from sales. 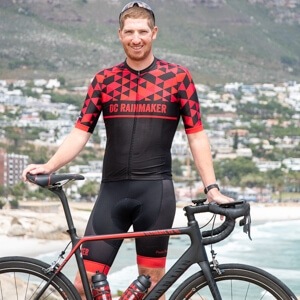 For example, a single instance of selling an item below MAP for a Garmin retailer will get them a 6-month ban for selling that item – without the ability to re-stock during that timeframe. In the rest of the world, specifying a minimum price to a retailer is considered illegal. In fact, in the EU, if a company even hints to a retailer that they should be at higher prices, that company is liable for a 20% final on worldwide sales. It’s crazy. I got my Tacx Vortex from a company in Germany (I am in the US). It arrived in less than two weeks, for nearly $200 less than that MAP. The rules you are referring to would be unenforceable to Euro-based companies. Of course, I did have to spring for a Euro to US plug adaptor to make it work! I am interested, how would this work for Clever Training? They are US based, but now have operations in Europe? Could Garmin et. al. still slap them for selling below a price point in Europe? What if the European branch shipped an item to a US customer? It’s complex, but roughly speaking, yes they could. While MAP is illegal in Europe, it’s actually not illegal for companies to limit distribution to certain countries. 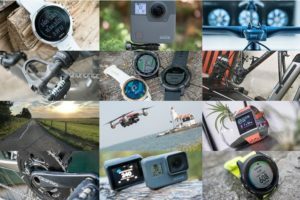 So Garmin can limit a company selling from Europe to the US. That’s why if you look at Wiggle and change your country to US, things get interesting really quick. That didn’t use to be the case – but changed semi-recently. 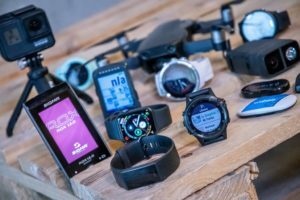 In the case of European retailers, Garmin (or whomever) could shut off their supply of devices if found to be shipping outside of territory. For major companies like Wiggle or CT shutting off that supply is easy, because they have direct relationships with major brands. Whereas for some smaller webshops they may go through a web of distributors, which makes it tougher to execute on. 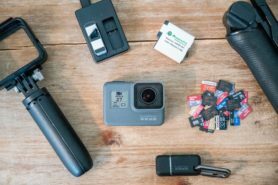 But again, GoPro is an example is one of the fieriest companies in this regard. In fact, they even track serial numbers by country. So if a serial number from Clever Training shows up in Europe somehow, CT gets whacked for it. Obviously, there’s challenges there because for someone like me, I could have totally legally bought something in the states at a Best Buy (or CT) and then moved to Europe. Not sure why the retailer gets whacked for my move. My only suggestion on all of this would be in these comparisons, to then let the shoppers compare themselves on price, but don’t leave out models that are known could be validly compared.. ie. for this article, you could/should have also included the Bushido Smart which can be purchased less than the Magnus’s list price. I don’t know details of MAP in this segment, but in other categories (eg. electronics), couldn’t the “Call for better price” options exist.. thereby etailers avoiding “advertising” a price they’re not allowed to? I found some amazing deals for trainers at a German site. I am a little afraid to order one but it sounds like it worked for you. was the electrical plug the correct format for the US? or was it EURO style plug? All trainer companies today ship dual-voltage trainers, so they work anywhere. At worst you’d have to buy a $1 power adapter online. However, again the biggest challenge with buying trainers while in the US from Europe is that if something goes wrong with it, you’ll need to ship it back to Europe. Generally speaking that costs a crapton. There are numerous sad stories about this in the comments of the different trainer reviews, especially for Tacx and Elite trainers. Not saying it might not be worth it – but as one who has shipped heavy things overseas, it’s likely not worth it for most trainers. Ray, noticed you are rocking the SSU and not the 735 in this review, are your personal preferences changing to the SSU vs the 735? He usually just wears what he is testing currently. I wouldn’t make a fuss out of it. Yup, correct, just a case of what I’m currently testing. From what I know, there are 3 types of trainers: the totally dumb ones that just do resistance, the ones that do resistance and broadcast power data and the ones that do resistance, broadcast power data and are controllable via some app. As I already have a Power Meter on my bicycle, I’m wondering why I have to pay for a second one inside of the trainer to have a trainer that can be controlled by an app. Couldn’t the trainer app or the trainer itself read the data from the power meter on the bicycle? Or does this already exist? 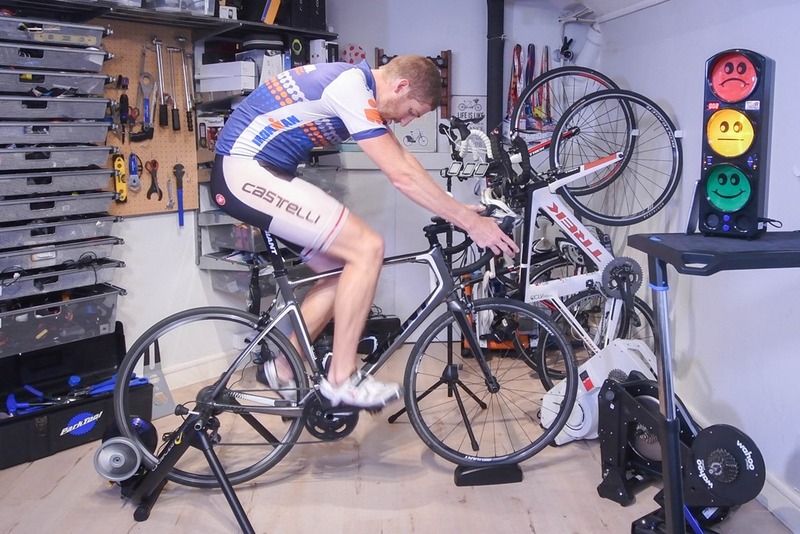 A bike with a power meter on a dumb trainer can only record whatever your power output happens to be. In contrast, a smart trainer (via ANT+ FE-C or Bluetooth equivalent) can provide a specific wattage of resistance as set by a computer, bike computer, or smartphone/tablet app. Any modern software worth it’s salt would be able to read your power meter so yes, in this case there is no real need for second type of trainer. 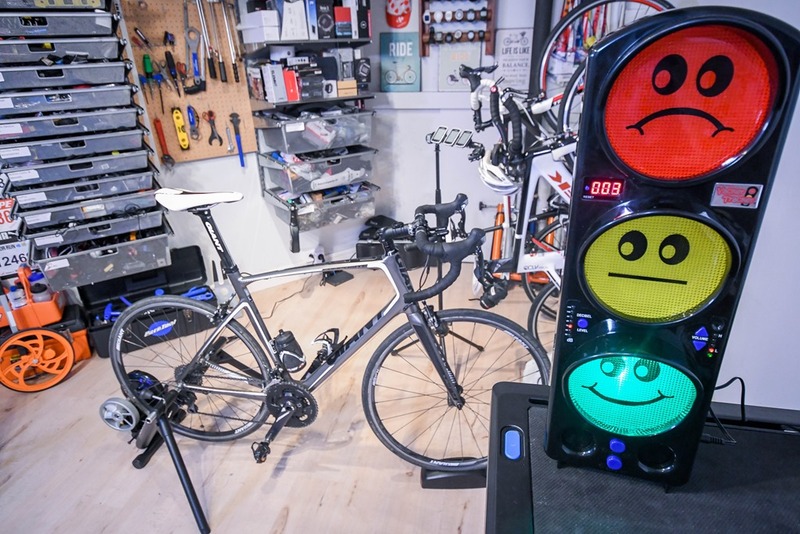 @Tom: What makes a “smart trainer” smart isn’t just that it can read power (or in some cases estimate power), but that it can also dictate a specific resistance (like 400 watt intervals) or replay the effort of an Alpe d’Huez ascent. That’s not to say that a dumb trainer with a power meter won’t meet your particular needs (it’s what I have) but that it would be up to you to dole out the correct wattage with your legs and the gears on your trainer. But that’s not a smart trainer (despite what Kinetic is marketing). Hello Ray. What is actual most silent wheel-on trainer + tire combo? I haven’t done a lot of tire testing, which is honestly the biggest driver of that combo. In this case, I’m just testing trainers with the same tire. Though realistically there’s not going to be a ton of difference in most of these. Definitely. Though, I’m not expecting any Interbike announcements at this point, unless there’s someone totally out of left field new into the game. Yup – as soon as a unit hits my hands, I’ll be diving into it. I don’t know when that’ll happen however. Perhaps someone more into the numbers can help me, but I would have assumed max wattage and max incline would correlate — i.e. if a trainer can handle a higher max wattage, then it should be rated for a higher max incline. What am I missing? Gearing / flywheel speed? I don’t think that I personally care if my rear wheel is spinning at 20 mph if I can achieve a gearing where my cadence is OK and my power is in the right training zone? It’s speed. Basically some designs can’t handle the lower revolutions at higher wattages. It’s why most trainers can technically go above their listed max wattage values, but at higher speeds than you or I could realistically attain. Ideally everyone would standardize on 20MPH (30KPH) references for both decibel levels and max wattages. And then for inclines, do something like @ 6-8MPH, which would be appropriate for any substantial incline (i.e. above 8%). How does the maximum wattage work for these trainers? I have a Vortex Smart, which is supposed to top out at 950W, but I’ve seen higher numbers than that. As you know, Zwift has achievements for reaching higher wattage numbers and I’ve (reportedly) gotten north of 1100 watts. Are the trainers not reliably reporting about their maximum numbers? Am I breaking my trainer? 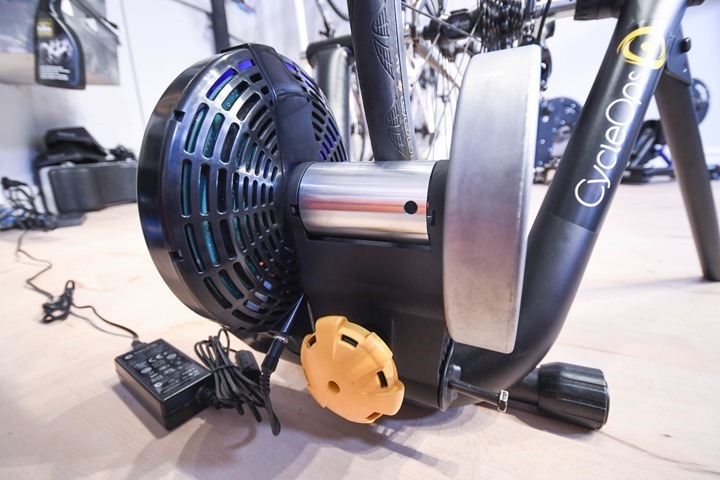 The maximum wattage is the maximum resistance the trainer can deliver to the wheel. When you reach that, they start faking it, by reducing the (reported) speed you achieve. If you want to keep your speed up, you have to work harder – the software recalculates this effort to more watts. Also, sometimes above those levels you get slippage or skips. Ray, so you’re telling me I need a new trainer? Can you be the one to break that to the wife? You’re a safer distance away from her then I am. Oh, it’s gonna be much more than a new trainer you need. I think you’re looking at the works: New bike, new cycling shoes, new trainer. Likely even a new big screen TV and speaker system for it all too. Might even consider building out a man cave just to be safe. FWIW, my new-ish CycleOps Fluid2 has that same quick release wheel mount and tire/roller adjustment, and both are better than any other wheel-on trainer I’ve ever tried. Highly recommended. Ray, could you add the dB to the comparison charts? The trainers seem so similar that how quiet they are might nudge me to select one over the other. I’ll try. I may have to put a line in the sand and do it going forward. 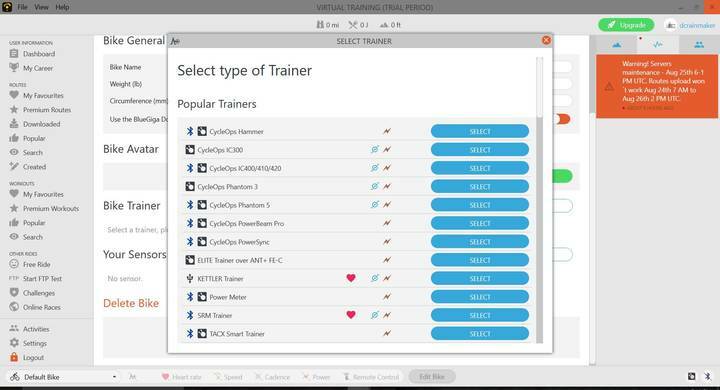 Ray, could you comment about how well the trainer worked with TrainerRoad? Particularly with using the Quarq as the power meter to control the Magnus? I’m wondering how well the Magnus works in ERG mode and how it reacts to quick sprint intervals, etc. I didn’t use power match with TR on this trainer yet, but, I’ll try and squeeze it in before the end of the week. Just pre-ordered my Magnus. Hoping to get an update from you in regards to how well it works with TrainerRoad with power match in ERG mode. Thanks! “INCLUDES MOTOR TO DRIVE SPEED (SIMULATE DOWNHILL)”. I would fix that a bit. The purpose of the motor in high end trainers is primarily to act as electronically adjustable flywheel. Ability to “downhill” is just an added benefit. Technically true, but no consumer cares about that from a feature standpoint. They just want to know whether it can simulate downhills. Well, I know of one trainer that won’t win that award: The LeMond Revolution Pro. While for now the only ‘baby’ I have to please is also the missus, I believe that’s a feature/characteristic evermore important as a deciding factor for those without a personal cave for several reasons. Is this the first trainer supporting boost? The front wheel 110m width spec is officially Boost110. Yay for the traffic light! The bkool pro and classic trainers are also a budget electronic trainer option as they can do ant+fe-c to play with non bkool software. Not sure what their prices are in europe and usa but I got mine for 500 nzd new (about 350 usd). They also have a pay as you go pricing but payg ones can’t do ant+ fe-c with other non bkool apps until 1 year of payment I think. Yup, they’re good options, but I suspect that Bkool is going to have challenges in competing going forward as Wahoo/CycleOps/Tacx/Elite all have released trainers in the same ballpark as the Bkool, but with more features and better accuracy. Any observations on within-interval calibration drift? On my Tacx Vortex, if I’m doing say 5 minutes at threshold then a few minutes easy and repeat, then I see up to 10% drift within the intervals (measured against Powertap hub). It warms up during the hard interval and cools during the rest. I don’t know how much of that is the tyre and how much is the unit, but would like something more stable. I did some repeats and I’m trying to get the graphs working to put in the post, but they were recorded on a unit with the new .FIT file specs and that in turn is hosing up my graphing/analyzer tool. So probably going to re-do them tomorrow. Sorry. Can’t put the copy editor to sleep. I’m so confused. 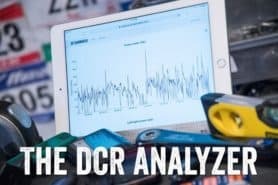 With the DCR discount the Tacx Vortex is less than $500. Could have had the Elite Digital B+ over the weekend from nashbar for $355 with the discounts but now see why as it does not broadcast power. Want a new trainer but trying to restrain myself based on your repeated suggestions to wait for your full trainer recommendations. Leaning towards the Vortex but this one is only $100 more. Between this and Vortex, which one? Guess I’ll wait unless you tell me to pull the trigger on one of them if there is nothing better in the pipeline in this range. Good to see some manufacturers taking into account that rear (through) axle standards are becoming wider and wider (142, 148 and even 156 or 157 mm wide for some). I am also looking for silence trainer. Because my neighbors hate me. I use to do trainings around 300watts, which turns out to be around 90dB on my TACX Blue Motion. That is the level of jet plane taking off. I spent hours googling something silent and not as expensive as TACX NEO. Ended with Elite Fluid trainer. All the reviews looked good. It is silent around 20km/h but loud as hell around 300watts, around 35km/h. Moreover the fluid trainer resistance stalls about 25% when the fluid heats up and the unit is hot as iron. I know the speed affects the loudness, but I care more how the power affects the loudness. Looking forward to your trainer guide, hope to find some loudness guidance. don’t get a Magnus if noise is a concern, its very loud. You are welcome to read my other feedback below, noise may also be the least of your concerns as my experience is its a very poor product, paired with CVT it gets worse. Hi Ray, have you any news on the new Kurt smart control trainer as yet. Nothing beyond the initial press release stuff, and confirming with them that it does NOT have ANT+ FE-C, or a fully open API for apps to access (only selected apps will get access, i.e. TrainerRoad and Zwift). I’ll be spending some hands-on time with it next week at Eurobike though. I’ve expressed my concern to them that the lack of ANT+ (at all), or even ANT+ FE-C is honestly a bit of a huge gap. >I do think that simple product availability may end up being a huge driver for trainer purchasing decisions this year. I am intrigued by what he means, but cannot say. pretty clear that he is saying that some trainer are going to be unveiled but won’t be avaliable or only avaliable at low quantities for this winter. I guess Hammer. CT already have it as October. Which means people in Europe could easily not have (limited number of) units until end of November. At 7:16, Ray stops pedaling. Before the clock shows 7:17 – the rear wheel has come to a complete stop. It’s because at that moment in the video I hadn’t engaged FE-C into any mode, so basically it was just hanging out in free-form mode. Can I suggest that you also in your table try to keep track of release date? Like f.ex. first released, and then perhaps, latest release/iteration or something like that. It could be interesting to know if your looking to buy, to see if the product has been out for a few months vs. almost two years… Keep up the good work sir, awesome site! Yup, that’s an easy one to add. I have it for GPS watches, but given the number of trainers in the database is tiny in comparison, should be a quick item for me to add. Thanks! Maybe being too picky, but maybe not. The early comparison is with the Tacx Vortex – but that should be the Tacx Vortex *Smart*. There is/was a not-so-smart Tacx Vortex that is not FE-C controllable. I can imagine someone buying/comparing an old stock Tacx Vortex and being disappointed that it is not ‘smart’. I’m not sure I understand. The data comparison in the post is against the Tacx Vortex smart? Yup, you’ll get a power meter guide immediately following Interbike, as there will be some outstanding power meter announcements coming out then. That’s Sept 21st-23rd, so then the week after. Edge 520, 820, and 1000. I don’t remember off-hand if the ‘Explore’ editions of the 1000/820 can also. Hi Ray, have a bit of a trainer workflow question. So my wife is getting into riding as well, and we’ve been considering a smart trainer (currently I use my powertap wheel and swap tires). Do you think it would be easier to just get a wheel-on smart trainer with fairly accurate power (like the magnus), since I have two extra rear wheels we can use inside, or get a direct drive version. We both currently use 8-speed, but I may be upgrading in the hopefully not too distant future, so I don’t know how quick changing freehubs would be. My wife doesn’t have the patience to be switching things around, she just wants to ride and doesn’t really care about power and all the stuff that I do, so just curious if the wheel-on smart trainer would provide the path of least resistance. Probably wheel-on would be easier for you. The Girl somewhat prefers wheel-on trainers from a getting it on/off standpoint – for similar reasons. As some other commentators above, I have to add my plead for more insight about the noise levels of different trainers. It’s a key purchasing criteria for me as well. accurate noise measurement requires very strictly controlled experimental setup as there are many variables. What ray is doing with the loudness traffic light is pretty much as good as you’ll get without professional lab (expensive!) Measurements. As ray says, speed is is key variable. So a trainer which can simulate a higher maximum slope will be able to provide the same power resistance at lower wheel speed and lower gearing and thus lower noise. For example a taxc bushido can simulate steeper slope than vortex. At say 400watts, you could run the bushido at lower speed and thus noise, assuming you can gear your bike low enough. Trainer feel may be different at low speed though. Does lack of temperature compensation on the magnus cause any concerns? Will this change power accuracy as the unit heats up while riding it or when I’m just starting my ride? If I use my power meter and use power match do I still need to do a calibration every use? I don’t really understand the whole calibration process to be honest. If I didn’t want to do a calibration 10-15 minutes into my ride (seems like this might affect intervals on trainer road and break the flow) what trainers have this process more streamlined so I don’t have to perform a calibration other than say before I start? Thanks so much for all of your reviews. I have been a long time follower of your website. You are my goto review and info guide! I was excited about the Magnus until I saw that it is not compatible with 650C wheels. Why? Guessing the thrown length from the roller to the 650C is not enough and the wheel slips but the difference between 650C and 650B can’t be that much? Did cyclops just decide it doesn’t want to support small frame TT bikes? Fantastic review, I want to buy two of these trainers . Would I be able to use most of what this trainer had to offer if I don’t have Internet at my house ? I know that’s weird but I work on a computer all day long at my office and really don’t want when I get home . I have 4G on my cell but not unlimited data . What key functionality would I be missing out on just using an app on my phone ? Than you. You can use everything without internet. Though, I’d just download what you want app-wise elsewhere onto your phone or pc or whatever. But apps like TrainerRoad don’t need internet for general workouts, and the same for Virtual Trainer. Apps like TrainerRoad would use it for updating the app occasionally. Hi Ray …. in the various interactions and investigations of my Magnus by Cycleops support, for CVT to work I am told you need a active and stable internet connection. This has been relayed to me by Rob @ Saris/Cycleops. @Bob, the Magnus has given me endless problems, paired with CVT (their software) it also becomes unpredictable and the workout resistance can vary greatly so much so that the same workout interval can easily be completed, 5mins later with calibration you may not be able to complete a single interval of the same intensity….. Odd. The internet in the DCR Cave is actually crappy. Really bad in fact. It’s underground far away from the access point and even adding extenders still has troubles. I’ve really never had trouble with CVT or the Magnus in that case with bad internet. Have you tried other software? on the first magnus i tried some trial software where i was able to repro the issue, which in my mind confirmed it to be a device/hardware fault. the new RU only arrived yesterday and i have shared the feedback with Saris and they suspect it to be multiple software issues in CVT that i have picked up……I cant be the only user of a Magnus and CVT?!? Just to be sure, the Magnus does not transmit Speed nor Cadence info? Cadence no, but let me double-check on a final product unit in a day or two when FedEx delivers (since the unit I have right now is a very stale beta unit which hasn’t had a firmware update since July or so). Will a 3rd party cadence sensor sync with the Magnus to transmit that data to then transmit the data to the different training apps? I really doubt a 3rd party cadence sensor would sync to the Magnus itself, but a 3rd party dual BLE/ANT cadence sensor should be able to independently transmit to apps for recording. So… I think you get what you want, just not “through” the trainer? I received tracking numbers for both a production Magnus and Hammer late last night. They were shipped direct from CycleOps HQ in Madison, WI. In looking at the tracking this morning, it’s set for delivery tomorrow morning. It landed at CDG at 1AM my time, though for whatever reason didn’t leave airport grounds. Looks like customs clearance hasn’t happened yet. With the Kickr Snap currently delayed and now the Magnus available would you pick the Magnus over the Kickr? Yeah, the KICKR SNAP delays are wonky, not sure how they misjudged the holiday season. Not exactly a surprise. I’m going to try and get it unboxed/quick 5-minute tested today, but having to assist The Girl in some big cake orders going out this weekend – so might not get a chance till tomorrow. Thanks for all your continued help! Question on the Magnus. In your article you state the calibration works with the Garmin EDGE line. I have an EDGE 820 and when I try to calibrate my Magnus it won’t let me. It just states “Temperature too low”. Any idea? I’m sure I’m doing something wrong. Try riding on it about 5 minutes. i saw that a few times this summer, and it was somewhat finicky in the beta builds as to when it would show, and when it wouldn’t. Thanks much. Will definitely give that a try. Oddly enough Trainer Road has no problem picking it up but Cycleops Virtual Trainer won’t. Android Apps. I’ll see if riding it longer works for that as well. Just as a super-quick update on the Magnus. Got the unit unboxed/built/calibrated/initial few minute ride before I had to run. The unit tracks within about 10-12w of a Quarq and PowerTap G3 hub, at 220w – so within the stated 5%. However, this was literally just 3-5 minutes of riding. In the morning prior to heading out for a ride I’ll do my standard high-intensity test with it (builds and then alternates 30×30’s at 150w and 500w), along with a few other quick things. I also quickly tested connectivity via ANT+, the CycleOps app, and as well as TrainerRoad via the iOS app for Bluetooth Smart. No obvious issues with basic control on any of those. … but TR can’t control it (resistance control) via BLE right now on iOS, right? Have they implemented more than a KICKR and Kurt Kinetic on iOS BLE? Don’t know about iOS but the Android app controls it. At least with ANT. I was messing around with the pairing in Zwift (on PC) this morning, and I got very different numbers from the Magnus than I did with my Stages PM. I was just doing a light spin, with Zwift showing about 100W on both ANT+ and Bluetooth from the Stages, but in the mid 70s from the Magnus on both BT and ANT+. I did the Stages calibration from their Android app just prior, so I’m not sure why Zwift would read such different numbers. Coincidentally (or not), during the subsequent Zwift ride up to the tower, I noticed that an 8% or 9% grade and a 14% grade seemed to have about the same level of difficulty thru the trainer, too. Not sure if this was an issue with the Magnus in general, my unit specifically, Zwift’s control of it, or if I was just on an endorphin high and imagining things. Like a few people have mentioned in here, we’re currently waiting on a Magnus unit right now. Once we get it in, it’ll be a priority to get the Magnus BLE compatible with full electronic resistance control. But you’re correct in that you won’t get resistance control over BLE on iOS just yet, it’ll only transmit a power signal to TR. We’re working on full resistance control on Tacx and Elite trainers but the KICKR/SNAP and KK smart control are currently the only that can be controlled over iOS. We’ll keep everyone updated via our social channels once we get the Magnus fully compatible on iOS. Thanks! I am dreaming of such a good seamless experience…. Thanks for the update. I’ll be interested to see if you can connect to the Edge 820. I was finally able to get it connected to the Cycleops Android app by changing the order of how I tried to connect. Plugging the trainer in after I hit connect. So I was finally able to calibrate. Boy does that make a world of difference in numbers. Lol. Still not able to calibrate with TR android app but not too concerned now that I can on Cycleops. It connects no problem to TR just doesn’t calibrate. I’ve connected and controlled with Edge 1000 without problems. I have heard reports of the Snap behaving badly at low wattage and that it is a bad choice of a trainer for someone with a really low FTP. Think the Magnus will be any better? Since I am getting either this or the Snap for my Fiance whose FTP is surely <150 this is a big deal for me and would be a big reason for me to go Flux over a wheel on trainer if it is indeed the case. Any further updates on how the Magnus performed in your high intensity tests? The Magnus performed mostly fine…I however did not. Apparently doing high intensity tests after my ride was a poor idea, didn’t quite get through them before my legs gave out. I had one weird oddity where the first pass through the signal totally dropped out and TrainerRoad stopped controlling (it also stopped broadcasting to the Edge). I never saw that during beta, and nobody else saw that either. Simply unplugging/plugging in resolved it, but definitely something to keep an eye on if it happens again. I noticed that TR couldn’t trigger an ANT+ FE-C calibration on Magnus, so I did it via the app (CVT Mobile). I’ll circle back to them about that on Monday, and see what’s up there. Wattage spec-wise it was hovering around 5-6% on this, so a tad bit higher than I’d expect, but that doesn’t account for the fact that I was comparing it to a Quarq upstream, so you’re going to get 1-3% drivetrain/etc loss there (especially since this drive train needs to be cleaned). So it’s still good, but I wanna see about doing the calibration from TR, because I don’t think it’s getting the offset correctly, hence why it was a tiny bit higher than I expected compared to last night when I did it all from the CVT app. Thanks for getting back to me! Hopefully those problems aren’t consistent across all units but would love to get some more feedback from you as you have more time to work with it. I decided to buy (pre-order) it as the VIP sale was too good to pass on so hopefully I can test it out for myself soon enough. Thanks for all you do. We’re still waiting on a unit to iron out whatever’s up with the calibration. Should be getting one very soon and we’ll get that hashed out ASAP. Hi Ray, did you get feedback from Saris/Cycleops? I have logged too many calls with them, received a replacement unit, and it does not get better or consistent…. Well, looks like the CT code expired early. Crap. Was just about to pull the trigger on a magnus. Oh well..
I’ve validate it’s still working. Double check you’re logged into your VIP account before applying the code. Thanks for the support! Just an FYI, Trainerroad does not support the magnus at this time. I also can not get erg mode to work in zwift. Haven’t tried Zwift yet so can’t speak to that but TrainerRoad support has been awesome to me. And I’ve had a lot of questions. I was told that they are waiting on a Magnus to come in to troubleshoot. The only thing that I’ve noticed that isn’t functional in TR is the fact you can’t calibrate. Outside of that it seems to be working. Were you using Bluetooth? Did erg mode work? Using the Android app. Connected using ANT and ERG did work. It works (control) on PC with ANT+ FE-C. As noted earlier, calibration commands don’t seem to work from TR to Magnus over FE-C (doesn’t even show option). For iOS you can see power/speed, but not control it. I haven’t tried Android, but Socia seems to cover it. I’ll follow-up with TR on why iOS control doesn’t work, since it’s identical to the PowerBeam/PowerSync BLE piece that’s been around for years. I haven’t followed Cycleops in the past until now. Are you confident they will support and fix this issue? I got the Magnus specifically to use both TrainerRoad and Zwift from a macbook pro so if you don’t think they will fix their issues and make it fully compatible with all the usual features (calibration, Erg mode, etc…) then I am going to cancel my pre order and get the fiance a Flux instead. It depends, if you’re looking at ANT+, then it doesn’t really matter, as things are pretty much all the same there. Also, I think there’s a bunch of confusion above on which apps and connectivity methods people are using. Some work, some don’t. But more importantly – some of those have never worked (i.e. TR controlling non-Wahoo trainers on iOS). Btw, there’s no saying Flux is any better right now (actually, I can tell you it won’t be any better on iOS). TR hasn’t seen that yet. We can assure you that the calibration issue will be the first to get fixed when we receive our Magnus unit. We will then move to get full BLE support as well. So just to be clear, the Magnus can connect and be controlled on all versions of our app over ANT+ as an ANT+ FE-C trainer. The only thing not working at the moment is calibration. Over BLE, the Magnus can only transmit a power signal at the moment. Once we get the unit in-house, our first steps will be to get full resistance control over BLE. Again though, are you using ANT+ or BLE to control from the Macbook? Just in case you don’t catch wind from my other replies regarding the Magnus over BT: Currently we only fully support the Magnus over the ANT+ FE-C profile. So you’ll need to connect the unit over ANT+ to get full resistance control. Once we get the unit in the office, we’ll begin work to get full resistance control over BLE as well. As of right now, the only thing you’ll have an issue with when using the Magnus and TR is the calibration. In the meantime of us getting the unit, you can use the Cyclops Virtual Training app to do a calibration and the value will be stored on the unit and carried over while using TR. I could be wrong but I was told by Trainer Road support that you can calibrate on the Cycleops VT app and it would “carry over” to the TR workout. That’s what I did. I’m not 100% sure on the validity of that however. That said, I spoke to the TR folks overnight, and they’ll stop in this thread Monday morning to help clarify where things stand on the various platforms/protocols. I can confirm that the calibration value will be stored on the unit itself. So if you get the calibration done in CVT, it will indeed carry over if you plan to use the Magnus over ANT+ FE-C with TR. Once we get the unit in-house (soon), our first priority will be to get that calibration dealt with and then work on BLE support as well. Just to be clear, right now the Magnus is fully supported (with ERG control) on all versions of TR over ANT+FE-C. BLE, not quite there yet. But it’ll be fully supported via BLE as well down the road. Thanks for your responsiveness and clarification regarding the iOS app – BLE – ERG control issue! I know it’s an unfair question given you don’t have a Magnus unit in-house yet, but is there a timeline for full BLE resistence control on the iOS app? If it happens by end of December, I may wait on purchasing additional ANT+ hardware. Any farther out and I’ll just pony up the 80 bucks for the Wahoo ANT+ key and Apple adapter. It’s good to see the idea of supporting more brands via BLE, but do you have any comment on supporting Tacx trainers over BLE? The Magnus is new, and I assume using the same BLE api as the Hammer. Similarly I assume the Vortex Smart, Bushido Smart, Neo and new Flux use the same API (some of which have been out quite a bit longer than the Magnus). Nevermind Nick (TR), I see your comment above for other trainer brands. Very welcome! And just to add, the Magnus over BLE will pair to TR and transmit a power signal (even on iOS), but just no resistance control yet. And to answer your question about a timeline, we don’t feel safe announcing that without the unit just yet. Sorry to give you a vague answer like that, but we’ve been told our unit should be here soon and we’re at a bit of a stand-still until that happens. I can assure you though that BLE implementation for resistance control will be a main priority once it arrives. That said, it could also be useful to have the ANT+ capabilities with your iOS device — you never know when you’ll need to connect an ANT+ sensor! Hope this helps! So, if you have to recalibrate in the middle of the ride at about 15 minutes, how much of a pain is this? Do I have to stop my workout? Let it spindown to a full stop? How long does it take? What if you’re in the middle of a Zwift race? I have no experience with wheel on trainers so wanted to make sure this isn’t too bad or else I am leaning towards Flux even more. When I’m doing testing, I generally calibrate at 0 minutes, and again around 15 minutes. This is more important for wheel-on trainers than non-wheel on, as things warm-up*. It’s even true of the CompuTrainer. I guess I more meant what is the calibration process like? Do I have to stop pedalling? Pause the workout? Quit the Zwift race at 15 minutes? How long does calibration take? Calibration using the CVT app is that you speed up to 18-19MPH, and then hold it for two minutes, and then it’ll ask you to stop pedaling. It’s a bit more…long…than most trainer calibration procedures, which only require you speed up to 18MPH and then coast. Good morning. The calibration process takes 2 minutes+ which seems like a pretty long break when you are just getting into a workout. Because of this would you just ride for about 10 minutes before you calibrate and start your workout? Seems like this accomplished about the same thing. Having to stop a workout 15ish minutes in for 3 or so minutes seems pretty crazy. Considering that it is almost like adding a 2 minute interval into the workout. Seems like there are some quirks with this that might not be on other trainers. I’m actually happy with it so far but wondering at the same price point would I be happier with the SNAP or does that come with its own set of quirks? For instance the clutch resistance adjust on the Magnus is absolutely awesome and don’t necessarily want to lose a function like this but the 2 minute calibration seems pretty excessive. 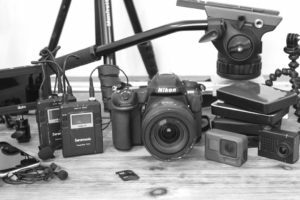 What do you do if you can’t get the speed up to what you need to for calibration? There’s too much resistance. I read the “maximum simulated grade” spec (on this and all other smart trainers) as saying “the trainer allows resistance adjustment progressively until the simulated grade is 15%”. Is that correct? For example, say I create a workout that does 2 minutes at each whole number grade from 0 – 15% (2m @ 0%, 2m @ 1%, 2m @ 2%, etc.). If I ride this workout in a single gear at 90rpm, the resistance (and subsequently wattage required to maintain cadence) should increase every 2 minutes thru the entirety of the workout. I created the workout mentioned above, and rode it this morning. I rode it at as close to 90rpm as I could. I didn’t ride it single gear the entire time, but I set the gear to my lowest inside the 2% block and left it there. The power required to maintain cadence at that gear increased in each block thru 5%. When the 6% block started, the resistance did not change, nor did it at 7% or 8% (i stopped at 8%). In the 6%, 7%, and 8% blocks, cVT did show that my speed was decreasing, but I suspect that was a calculation performed (like Zwift does when using a non-smart trainer). The graph cVT gives on their website shows the speed decreasing in each block above 5%, too. But… I also tracked the ride with my Edge 1000 (with the Magnus only added as a power meter, not as a trainer), and all its measurements are consistent with cVT – except for speed. Edge showed my speed was constant above 5%. I imported the Edge workout to cVT and created the attached pic with screenshots of the graph from the cVT recorded and Edge recorded workouts. Methinks I need to talk to CycleOps. Interesting (and weird). I’m wondering if it’s a CVT bug. I’m trying to think of another app that you could test that would specify inclines to see if it does the same. I noticed the problem in Zwift going up to the tower. Resistance at 14% wasn’t nearly what it felt like it should be, and was the same as much lower-grade sections. I also noticed it in the PC version of the cVT app. For giggles, I downloaded VeloReality app and rode (briefly) a section of the Paterberg Lap ride that comes with it. Resistance didn’t change on sections above 5% there, either. I downloaded the Elite app, but I got frustrated with the problem (and a little tired) before I tried it. By default our software scales grades over 5%. Go to settings/Grade Reduction and set the grades to be one to one (unscaled). I set that before I did the ride. I don’t think it’s an issue with the software, but rather with my trainer. I’m starting to think this problem is not so much a bug or malfunctioning unit as it is me simply using too low a gear/cadence to make the trainer simulate the larger grades. I read a review on another site (forgiveness, please! ), and the reviewer said he had trouble getting the Magnus over 200W on a 39×27 gear on the Radio Tower Road climb in Zwift. I’m not running nearly that hard a gear when I do it on my Magnus-mounted gravel bike. If the Magnus isn’t going to simulate those higher grades at low speeds, it’s easy to imagine I wouldn’t see much over 170W of resistance from it on my low-speed, low-gear attempts. I’m also getting an odd noise that sounds like the electronics housing is vibrating when I get the wheel moving over 20MPH, so I’m going discuss both the grade simulation and vibration issus with CycleOps tomorrow. Did you get any resolution on either issue today? Work got in the way and prevented me from calling. I’ll try again tomorrow. Damn having to be an adult anyways. I called them yesterday morning and explained what I’m seeing. After talking about it for a few minutes, the guy on the phone didn’t think this was normal. After consulting some coworkers, he returned to tell me was going to get with one of the product folks and would call me back. Haven’t heard back from them yet. Still no call back from CycleOps today. Between this and a separate issue with non responsiveness on a case regarding firmware update checks failing in CVT desktop app, I’m punting and returning the Magnus. Fortunately, I got the Magnus from Amazon so the return is very easy. Even better: I didn’t realize it until a few minutes ago, but I bought the Magnus after Amazon started their holiday return cycle for this year, so I don’t really have to send it back until I find another trainer to use (or Jan 31, whichever comes first). Unfortunately, I’m now back in trainer-search mode since the wife virtually threatened me with bodily harm if I took her bike off the Fluid2 I already have. I’m 90% ready to punt as well. Sort of a bummer. Really want to like it. I think I’m resigned to the SNAP Kickr. One of the reasons is the Thru Axle adapter seems to be a lot better design than Cycleops. Wheel off is not an option. I know that is probably, well not probably, definitely, going to come with it’s own set of issues. Technology. Part of my reasoning, in fact a major part, is the thru axle adapter. I don’t think it is designed correctly on the Cycleops. You really have to put a lot of effort, and I mean a lot, to get the bike into the trainer. Almost afraid I’m going to bend my frame. It’s almost as if it is 1/4-1/2 inch too long. The heavier flywheel seems to be worth investigating as well. Haven’t fully committed yet but am leaning towards giving it a shot. Just curious if Cycleops ever got back to you about this? I know you were looking to return it, but I’m contemplating a Magnus and was wondering if any more info ever came to light about this potential issue? The firmware thing was worked out with an update to the VirtualTraining app. I never did hear back from CycleOps on the power/resistance thing. I actually still have the Magnus, but it’s going back this tomorrow. To maximize some gift cards I got before the holidays, I bought the Magnus from Amazon. It happened to be at the very beginning of their holiday return cycle, so I technically have until the end of the month to return it. I really wanted to grab a Tacx Flux, but with all the reported issues of the belt getting off-center and causing problems, coupled with my Magnus issues, I figured I should hold off on the Flux. Instead, I pulled the trigger on an Elite Rampa from Clever Training the other day, and it is slated for delivery tomorrow. Thanks again for all of your sports-tech insight! I’m still debating between Magnus and Kickr Snap. Sounds like you may still do a follow-up on the Magnus production unit? If so, I’m curious about two items. First, any stability concerns with the Magnus frame? I’m a bigger rider (220 lbs) with a high road bike seat post. Second, are claims of “erg tracking” variability on the Magnus true? Does that make the experience meaningfully different from the Snap? Thanks again for all your work. I’d say that the KICKR SNAP is more stable than the Magnus from a frame standpoint. I find that at 6’2″ on my tri bike especially, that it’s a bit wonky getting up there. Once up I’m I’m fine though. I didn’t see any Erg tracking issues yet, though, I’m still doing some digging (rotating through a bunch of trainers at once). I “purchased” one of these from CleverTraining wed before blackfriday. While it was in a preorder status the anticipated shipdate was the beginning of Dec, well the shipping date has now been pushed to sometime in Jan? Needless to say I’m not super happy at the moment. I’ve sent a message to cycleops asking if they are having any production issues with the unit and hope to hear from them in the next few days. I’ve looked online and haven’t seen anything about problems on their blog or facebook. Just to be clear, did you get an e-mail from Clever Training saying it was pushed to January? Or are you talking about the site status for new orders? As for delays, it’s simply them being behind all summer/fall, nothing beyond that. I only ask because I just got a texted with them getting numerous palettes of Magnus units about an hour ago, so I know a crapton of CT orders are headed out today. FYI ..Just received a ship confirmation from Clever Training..my Magnus is on its way!! The last update I’d received from Clever Training about my order was on Dec 1st so I went to the site and checked the item as well as my order status. I’m glad to hear they got a pallet of items in and look forward to an update saying it’s shipped. The winter storms on the west coast have made it harder to be patient as there haven’t been a lot of days to ride where it wouldn’t be miserable. Mine is on the way. Due tomorrow. Is there something special about the calibration process I am missing? Im not a terribly fast biker with ftp around 200 and to get my ctv app calibration up to the required 18 mph is taking a 230-250 watt effort for around 2 1/2 minutes before calibration is complete. I tried fast spinning which showed a lower than 18 mph speed and the calibration failed. Seems excessive and a serious stresser on the legs before my Trainerroad workout has even begun. Im also seeing a huge difference in watts between my powertap wheel and the Magnus, without much difference after calibrating both. I agree. The calibration on the Magnus is a bit, shall we say, excessive. In theory it makes sense. The longer you are doing it should give it more accurate results but in practice it makes no sense. That’s a hard interval before a workout even starts. And how do you fit another one in 10 minutes into the workout without disrupting your flow. What kind of differences are you seeing the WATTS? And which way are you seeing them? Too high or too low? I have been seeing about a 30 watt difference between the trainer and my actual powertap wheel, with the wheel being the higher end and more matching my effort. I have powermatch enabled so I am assuming i am seeing the numbers from my wheel and not from the trainer. I wonder if i need to do the calibration on the Magnus if i’m not using the power numbers its presenting…. Have you tried changing your gearing to make for a higher speed (i.e. big ring up front/little ring in back)? Cadence doesn’t matter for calibration – it’s all about speed. I own a Magnus. I do only one calibration (in CVT, before switching to Zwift if that’s where my session is taking place) after a 10 minute warm-up at 92 RPM, as I don’t see the point of doing one before I warm up the unit. From 150 Watts, I increase the power by 10 watts every 2 minutes. (You may find my 10 minute warm up in the CVT application or web site “workouts” section). Since I’m no strong rider (FTP at 230 watts), I do not need to crank the clutch knob all the way until it clicks. I simply do two and a half turns from the point where the Magnus roller barely touches the tire (I do use a trainer tire for better grip, and do not get tire slippage even if I don’t fully crank the clutch knob). I suggest you try that and see if your calibration routine is less demanding. Also make sure your tire is inflated to the highest recommended pressure to get less rolling resistance from it. In regards to the calibration process itself though, (like Ray mentioned) getting into that big ring up front small in back will help you achieve a higher speed with relatively less effort. I have the Magnus but cannot get the yellow clutch knob in the rear to click/pop no matter how much pressure I put on the well-inflated tire (120 PSI), and I’ve put a great deal of pressure on the tire (to the point where the pedals wont turn). CycleOps says my problem is due to the fact that I am not using a training tire and that they’re necessary due to the firmness of the tire surface. From your account it seems that the click/pop does occur with less than maximum resistance. Could you comment? Do you have an idea what the problem may be? Incidentally, I am using Michelin Pro 4 Service Course. I also tried Continental Grand Prix 4000 II. The Michelin’s I’d like to wear through. Paul Couture: I’ve been very “surprised” (i.e. worried and annoyed) by how much I had to tighten clutch knob in order to get it to click, which is why I simply don’t get to that point (see my explanation a couple of posts above). I would be very surprised if Cycleops’ explanation was the reason for your problem. Have you tried cranking the knob less? Did you get any tire slippage? (Make your tire and the Magnus’ roller are clean). Don’t hesitate to involve your local bike shop if necessary to resolve this. Hi, Felix, I appreciate the response. I cannot successfully get the Magnus clutch knob to click. I fear it would puncture my tire if I kept going until that point. Where I’ve stopped short Mark Cavendish could not rotate the pedals. I’ve used the device around six times and similar to your system each time did so at around what felt right. But that’s annoying. How then can I be sure then that the information I receive from the trainer is accurate? That is my primary concern. It also means I have to jump off the bike to fine tune the knob or have my wife assist, which is more usual. And it’s not a faulty knob. I wonder somewhat whether I assembled it incorrectly. But then I wouldn’t know how I went wrong. Similar problem here. Have you had any luck from CycleOps? Has anyone heard anything yet? I’m having this same issue and I emailed Cycleops but haven’t heard anything back. I am using a Cycleops trainer tire, so that definitely isn’t the case. When I finally get it to click there is a ridiculous amount of tire deformation and I can barely pedal standing up. I also am worried that if I just loosen the clutch knob that I will be getting inaccurate readings. This has been rather frustrating since I was so excited about my new trainer. They said it’s normal for the amount of tension normal for the roller bar to sit slightly at an angle. I’m not comfortable with either of the above so I returned it. My clutch knob also went in crooked. Having used many trainers before this just didn’t feel right. Tried this, of course. It has no effect. PLEASE, somebody, help me!!! Just to be clear – you put it in the biggest ring in the front – and the smallest ring in the back? That’ll give you the most speed possible. What’s your max speed? Also – have you tried contacting support? I am a 58 year old fellow with an old RANS V-Rex recumbent (26″ tire, SRAM 9 speed) and am looking for a trainer to get in better shape for next year. I am VERY out of shape and at my age don’t expect to be testing the power limits of any trainer. I had been considering the Wahoo Snap, but this looks like another viable option. I live in the US so for warranty/repair reasons feel Wahoo or CycleOps would be best bets. I have a Garmin520 setup on the bike. My primary intended use Is Zwift. I’m more concerned with riding experience than accuracy. For my needs is there any advantage of one vs the other, or is it a virtual draw? Just picked up Magnus today coming from a 6 year old Fluid 2. I’ll reserve feel after having it a month. Right now the fluid feel I like better, but I’m use to it. Set up easy as can be. Downloaded 3 apps to Play with, worked decent with all. Calibration is a must. Pre calibration compared to quarq was 40-50 watts off. Post calibration 10-20. Little frustrating with group riding in zwift. I ride 3.0-3.7 watts per kg for sweet spot riding and will ride 4.5ish for 3-5min intervals. No way I can touch that on this. It took considerable effort to stay at 3.0. Heart rate near threshold. That’s a bit frustrating to me, but I wasn’t sure what to expect or what acceptable yet. Definitely won’t hang in on any zwift races or enjoy my ftp test reading 20-25watts lower. I’ll update a post after I log a full week then a full month. Not sure I dig erg trainer riding. It seems like I’m climbing the alps or going downhill. Feeling like I should have just got a new fluid trainer, but I’ll reserve final judgement for a 10-20 hours logged on it. I purchased a Magnus a few days ago and have a similar observation: My Stages and PowerTap hub PMs are consistently reading 15 to 20% higher than the Magnus-recorded power output on CVT, all post-calibration. I believe I’m doing the wheel/clutch/tire inflation etc. correctly. Observed this through a range of output (50W to 300W), so when I say “consistently” I mean it’s the same % difference regardless of power output. It’s hard for me to believe that I have *that* much drivetrain loss/friction from the crank-arm/hub to the Magnus roller on a 700×25 tire inflated to the recommended 120psi, but if this is the reality it will be a PITA to keep 2 separate sets of power curves for interval training, so I will probably punt it if I can’t figure this out. Yeah, that seems oddly out of whack. And you’ve tightened the knob till it clicks, and done the long-form (2 minute) calibration? Yes and yes. I called tech support today and the representative told me that those kinds of losses/differences are “normal”, e.g from crank to trainer or from hub to trainer. I’m inclined to call BS on that. I just got my Magnus yesterday and I too am having the exact same calibration issue. My Magnus is consistently 30 watts (give or take 5 watts variation as I watch it) lower than both my stages power meter on my road bike and also my Garmin Vector power meter on my TT (race) bike. I also noticed while riding a route on the Cycleops Virtual training app that not only was my power 30 watts lower but my speed was also roughly half what my Garmin 510 was reporting at the time. In addition to blowing me up today this was pretty frustrating lol, hopefully this gets figured out soon. Same thing here. My first trainer tire deformed due to the pressure. Cycleops sent me another. They also sent me a new clutch with the same results. After a very hard calibration (I’m out of shape), 300 W for 2 minutes, power on both the Cycleops app and Zwift is 30 watts lower than from my powertap hub. Customer support, although helpful, is telling me the same thing; that the power won’t match with the hub. Something seems completely off here. I’m on the floor after calibration and the power numbers just aren’t right. I’m using the ipad and have downloaded the new firmware that is supposed to help with calibrations. Supposedly it’s easier to calibrate on the PC and the ipad will get a new update soon. The only way to get Zwift to match my powertap hub is to take the tension all the way down to 3 turns and fine tune until they match. This is a bit disspointing. Note that I’m not using the powertap to control Zwift. So I know it goes against the whole premise of ERG mode but has anyone experienced the same watts being harder to push in 50-17 versus 50-19. Just using those gears as an example. Same cadence. It’s actually not uncommon for different gearings to ‘feel’ easier or harder, even as the same cadence. I’m sure there’s some logical explanation for this – but it’s something I’ve long seen across virtually all trainers – be it the CompuTrainer, KICKR, or others. Yes there is a logical explanation. The torque transmitted to trainer at different gearing is very different as well. It is also very uneven. It changes from nice sine like shape at low torque/ high speed condition to some more distorted shape at high torque/low speed conditions. Especially in trainers that can not properly simulate inertia of a real cyclist (virtually all trainers btw). So while power can stay the same torque distribution and absolute values affect very much how tired our legs will feel. Human nature as we are not machines. Sam applies to real life riding as well low cadence high speed on flat feels different then low cadence low speed on steep hill as resistance of the air at high speed and constant gravity force on hill would react differently to cyclist’s input. Thanks to both of you. Was at the point in my TrainerRoad plan where I had to retest my FTP. Did that Monday and was excited as it went from 250 to 259. Was on vacation this week so did a few outdoor fat bike rides which stressed my legs. I’m starting SS Base 2 so the first 2 workouts are threshold. Couldn’t get through them. Noticed my gearing wasn’t what it had been so was hoping this contributed to it. I’ll know next week. Starting phase 2 over again. Minus the FTP test. But today is New Year’s Day. Off to do our annual fat bike ride with 100 others. Snow is in awesome shape . Happy New Years. Similar problems here with the clutch knob and it putting excessive pressure on the tire. I’m going to call customer service tomorrow as I had trouble with the calibration test with it tightened all the way to the click. I posted a pic on their FB page and a comment on the thread discussing the Magnus. So far I’m not satisfied and can’t ride it with he clutch knob clicked in. I have had no luck with Cycleops customer service nor on my own. Low confidence in the results of power meter when I adjust so that the bike feels right, which is well before the click. Will try Clever Training tomorrow and post their response. Please update yourself. Hey guys, check out my comment below on another one of DC’s threads about tire pressure and tension on the Magnus. Also another thing to keep in mind is that this clutch knob is basically a torque wrench and if you turn and push at the same time you will prevent it from clicking free at the proper tension. Just be sure that while you are turning the clutch knob that you don’t also push it in, you may see this help! I also have the “thump” at each wheel revolution. My biggest pain is not that though. When I’m doing a workout (TrainerRoad) and the resistance ramps up at the start of an interval, the trainer responds reasonably well to the new setting when I’m in the small ring (lower wheel speed). As soon as I do the same interval in the big ring (all at a steady cadence), the trainer starts increasing resistance and then “slips back”, sometimes never reaching the goal setting, other times only after a minute or so. Any ideas? Any chance it’s just a soft spot in the wheel from the trainer wheel being left on with the pressure applied between sessions? This can happen for wheel-on trainers, and may take a few minutes (or longer) to ‘even’ out. I’ll pay closer attention to that. I have been leaving the tension on and the bike lives in the trainer so definitely a possibility. I’ll report back if that’s the problem, since a few here mentioned the same thing. Appreciate the feedback! No, it is like hat immediately and I do not leave it on there with the tension set. I have been off the trainer for a week and let it sit with no tension and full pressure. The thump-thump is still there, but I’m going to mark the spot on the tire and see if it’s consistently the same. The trainer still does not track ERG mode well when the wheel speed is over 20 mph or so. Not sure if it’s a Cycleops or TrainerRoad issue. 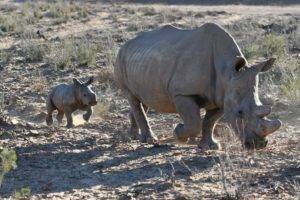 Hey Willem, I haven’t heard much about the “thump” issue but will stay on alert for any more info there. Regarding the transitions into intervals: I see you’re using PowerMatch while training with us. The reason you’re having that slow resistance change in the big ring is because you’re hitting what’s known as a “wattage floor” in your recovery intervals. This just means the gearing ratio you’re in isn’t allowing you to match your power to the target power in the recovery intervals. Long story short, when your power doesn’t hit the target during your recovery intervals, you’ll experience a laggy transition into the higher-intensity interval that follows. If you stay in an easier gear and make sure to match your power in recovery intervals, you’ll have a smooth transition into your intervals. Thanks for the response! That does make sense and I have no problem wearing out the small ring on the trainer, so all is good. Very welcome! Let us know if there’s anything else you need help with. Any updates on when the in-app (TR) calibration will work? Not sure how but CycleOps has broken their VT app (at least for me) and I can no longer calibrate the trainer. I tried re-installing the CVT app with no luck. The calibration button is missing other than in the “Free Ride” option and there it won’t work with a pop-up notification that my trail period has expired. Even though it says your trial has expired you should be able to click Continue to get to the calibration. I don’t know what version you are using but on the Android app this works. Would love to get the calibration in TR working though. I had this same thump sound, I found it to be the inner tube that was patched from a puncture. Put a new tube in, noise was gone. I have a 2011 Powerbeam Pro that’s got a defective resistance unit. Should I replace the RU or buy a Magnus or a Kickr Snap which would cost me an additional $250? Besides the dual ANT+/BLE FE-C what are the differences of these models to the older Powerbeam Pro? You get the new tech with the Magnus, faster response, and more connectivity but I think the Powerbeam has a better feel. You’ll get all of that with the Snap but for day to day I think the Cycleops just works. If you where happy with your Powerbeam, save money and get a new unit, if not go with a Magnus. Cycleops is a good brand. thanks Ken. The PowerbeamPro is still in the lineup with a heftier price tag than the Magnus so you would think there must be something better than just additional communication options. There’s new Magnus and Hammer firmware in town. Update via CVT (bit.ly/2kTSqZX) and PowerTap Mobile (bit.ly/2kU0x90). I saw trainer road released an update that allows for calibration within their software suite but after running the calibration my power increased significantly over the CVT calibration. Has anyone else had the same issue? I wasn’t aware that you could calibrate in Trainer Road. I’ve had an ongoing dialog with a support person on it and was recently told that feature isn’t yet live. I’d suggest continuing to calibrate in CVT. The good news is that with a recent update that CVT calibration only requires pedaling for 20 seconds now instead of 2 minutes. Finally! I updated my firmware but my CVT calibrations still take 2 minutes. Is there a different location in the app for the new calibration? Did you update the CVT app? Once updated, I just followed the same steps as usual and the calibration magically took less time. I guess I don’t know if I updated the app. Will check and see. Thanks. Hey! Quick question. If using the Garmin 520 as a control unit/power meter for this trainer are the cadence and speed sensor required for correct calibration? No, only a trainer that supports the FE-C protocol. Hopefully someone can chime in with an answer to my question. Moving to a new trainer and deciding between the Magnus and the snap. I know with the kickr I could use my Stages to control the power on the Kickr. Can my Stages also control the Snap or Magnus? Thanks folks. I hedged my bets on CycleOps about 18months ago, the intent was to get deliberate with my power training. I purchased the CycleOps PowerSync, the Joule GPS and the PowerCal. I engaged by analyzing my base fitness and began with my regime of VO2 max training. It has been going rather well with decent gains. 2 months ago the Powercal needed to be replaced due to it becoming faulty (non-warranty replacement) and last month the PowerSync started dropping connectivity to my Joule GPS or the Virtual Training app. Again out of warranty I have had to buy a Magnus (Powersync is no longer manufactured). My immediate feedback, it is very noisy compared to my Powersync…..and the Magnus cannot be controlled by the Joule GPS, forcing me to use my phone to control or select workouts. 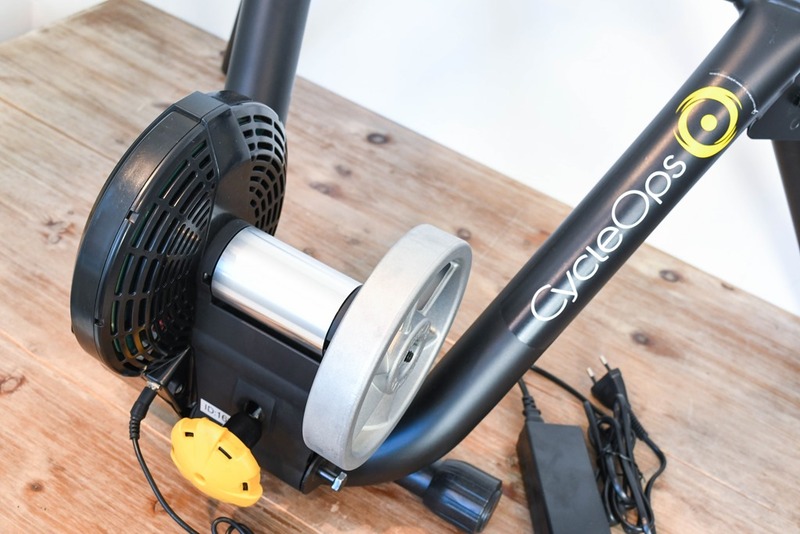 My advice, don’t buy into a eco-system, I am now left high and dry with a CycleOps no longer investing in Joule or a trainer that can be used without the TV volume cranked high for the neighbours to hear! just my feedback, and the calibration took forever…. Try a few different tires with the trainer. I found my schwalbes are quite noisy – high pitched squeak, but specialized rubber is rather quiet – especially if you can fit a 28mm tire. My experience is that the trainer itself is quiet fora wheel-on trainer and it calibrates quite well. Just out of curiosity, about how long is the spin-down calibration coming out for you with this unit? I’m using a Continental trainer tire inflated to 120psi, and I’m getting spin-downs in the 3-4 second range on my Magnus. This is significantly shorter than on my other trainer (a Hammer), which takes >20 seconds, but that’s expected given the flywheel weight and direct mount setup. I’m just curious if 3-4 seconds to spin down is reasonable for this trainer–seems awfully quick compared to the Hammer. The latest firmware update released last week has enabled cadence reporting. I don’t have a smartphone, but do have a new laptop. Do any of these four trainers work with a computer but without a smartphone? FWIW, no powermeter or cyclocomputer on bike either Thank you. Hi Ray, I am learning a lot from DC Rainmaker, thanks a lot, exceptional work. 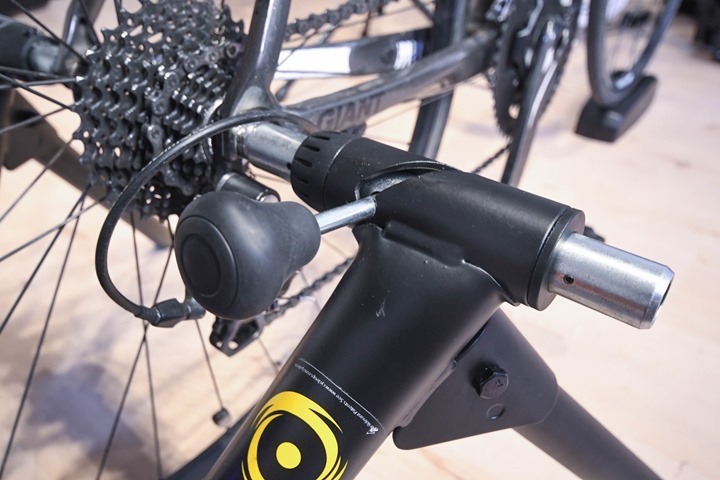 Do you consider the Cycleops Hammer and the Elite direto equivalent? 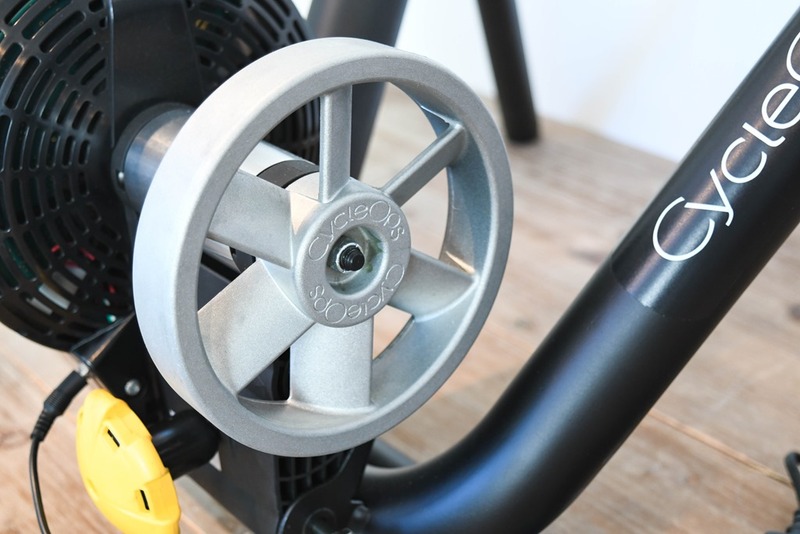 Amazon has brought prices down on the Cycleops Hammer , from $1,199 to $1,049 (without the cassette). Therefore, considering the Hammer and the Elite Direto Interactive are now just $150 apart, which one would you go for? Typically I’d consider the Hammer a better trainer than the Direto. Not massively better, but it just depends on which exact specs are most interesting to you. Like so many others, the clutch knob on my brand new (as of 1/15/180 Magnus never click. in fact, the first one I had I kept cranking (without pressing in as warned in another comment) until the handle broke (it broke the end of the shaft so that the bolt within was no longer captured). Returned unit to LBS where they said they’ve seen the same thing on the others they have…tried the demo unit in the shop and the same thing. Got a replacement from them and again, the same thing. I also have a Kickr Snap and decided to match the tire deflection on the two units (same bike and tire, Continental HomeTrainer). 3 turns after contact on the Magnus seems a pretty good match for 2 turns on the Snap. Frankly, I think CycleOps has a batch of defective clutch knobs. CycleOps support confirmed for me yesterday that they have a bunch of problem knobs that wouldn’t click and/or broke, both of which I’ve experienced. A replacement knob will be on it’s way next week. I have been pumping up to 115 psi, which seems to work fine on the Kickr Snap. I’ll try the lower pressure tomorrow on a virtual ride, which hopefully will improve the experience that I had tonight, which was very unsmooth, compared to my Kickr Snap. Appreciate all this info & Magnus user feedback. Very disappointed with the Magnus. I cannot finish interval workouts in PerfPro that I’ve done before on either dumb trainer or CompuTrainer (in a studio). I followed all the tips to calibrate, tighten knob, inflate tire, allow my Stages Power meter (PM) to control smart trainer, not speed up before interval starts, turn knob off when not riding. I have reviewed PM & Magnus power data post rides. At 40-50% FTP delta is low. At 90-150% it’s very high, 10-50 watts. So it makes sense that I’m cracking after one interval set. It remind me of shifting gears at the bottom of a hill & not having any momentum into a climb. Standing helps but I have to mash the pedals for 10 seconds to catch up. My FTP is 170W, weight 63.5 kg, 2.67 W/KGB. I would not recommend this trainer at all. I have called Cycleops/Saris twice. Very polite & courteous but no solution offered. They blame me. I was naive to buy this through an Amazon third party re-seller which will not give me a refund since they don’t think the unit is defective. If I didn’t have a PM I’d be even more in the dark. Shouldn’t need a PM to ride in ERG mode. Summary – Magnus is a waste of time & money. Don’t buy expensive, bulky items from Amazon. You can use a 142 with this trainer. CycleOps makes a through-axle adapter (sold separately), but I recommend the Roberts Axle project adapter axle, because you can ride with that axle still in. I know this is an old post, but I’m curious if anyone else has experienced Resistance Dropout when climbing a steep incline slowly. You start out at a realistic feeling resistance, but then the resistance suddenly drops to what feels like 0% for about 5-10 pedal strokes, then usually re-engages. This happens over and over and is REALLY annoying. Cycleops tech support suggest it was overheating, but having a dedicated fan for the trainer did not fix the problem, and when the problem happened the flywheel, roller, and cowling of the trainer were all cold to the touch. Experienced the problem last night at a 10% gradient, spinning 60RPMs and moving at around 4Mph (100Kg and in a 34×32, don’t judge me). Hi John – I’ve experienced this lately along with the inverse – sudden spikes in power for 5-10 pedal strokes where it feels like the trainer is seizing up. I mostly do lower intensity workouts of short duration so I don’t think it’s an overheating issue. Did you also notice lately that it seems slower to adjust to intervals? If I’m at 100 watts and then it spikes to 200 watts – in the past it would get there quickly in like 2 seconds, now it seems to take 5-6 seconds.